A few weeks ago, Steve took the lead on dinner. DD was at horse camp, I was back to work and trying to get back into the swing of the routine. Steve found this recipe on Food Network, one of Bobby Flay’s, and really wanted to try it. DD does not like peanuts so this was a perfect recipe to try while she was at camp. The recipe was pretty easy. He first made the dressing by whisking together rice wine vinegar, fresh chopped ginger, peanut butter, soy sauce, honey, sesame oil, canola oil, and chipotle pepper puree. I had no idea where to find chipotle pepper puree. I went to the internet and discovered it can be hard to find. If you can’t find it, take a can of chipotle peppers in adobo sauce. Place the peppers in your food processor or blender and blend until smooth. Easy! 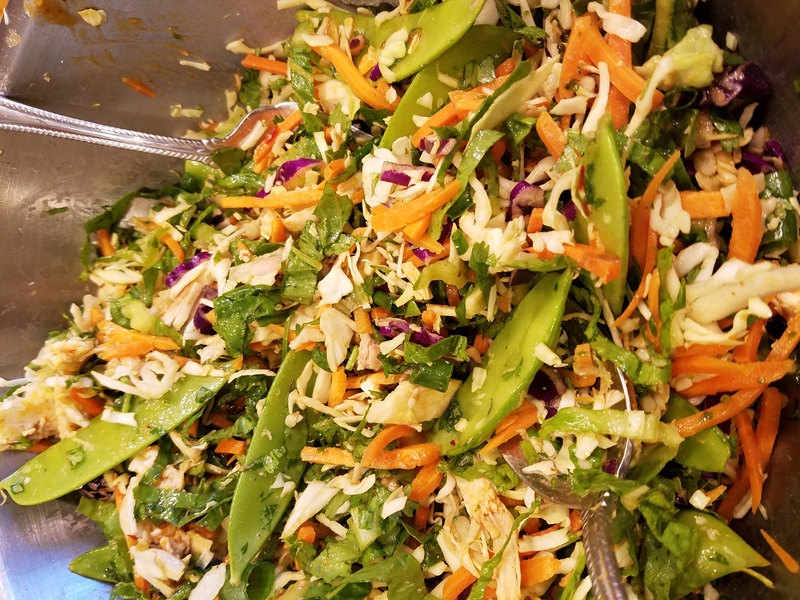 In a bowl, combine the Napa Cabbage (I cheated and used a preshredded bag of coleslaw), shredded romain lettuce, shredded carrots, snow peas, cilantro, green onion, rotisserie chicken, roasted peanuts, and mint leaves. Toss with the salad dressing and serve. I must say, though, it makes a TON of food. There was enough salad for at least six people. If we do it again, I will figure out a way to cut it. Whisk together the vinegar, peanut butter, ginger, chipotle pepper puree, soy sauce, honey, sesame oil, and canola oil in a bowl. Season with salt and pepper. In a large bowl, combine the cabbage, lettuce, carrots, snow peas, cilantro, green onion, chicken, peanuts, and mint. Add the dressing and toss to combine. Serve with a drizzle of chili oil if desired and garnish with grilled lime halves. We used a bag of coleslaw in place of the Napa cabbage. We did not julienne the snow peas instead we opted to leave them whole. The recipe called for topping the salad with the chicken. We combined it with everything. This entry was posted in Asian, Chicken, Gluten Free, Summer Eats.